Government agencies and councils in England that spend public money on lobbying ministers face a crackdown. 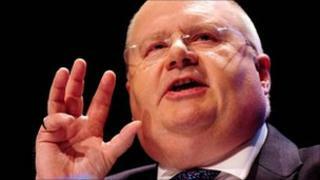 Communities Secretary Eric Pickles said it was wrong that taxpayers' money was being spent on political lobbying. He has told his department's quangos to cancel lobbying contracts and the code of conduct governing when councils can employ lobbyists is also being changed. But the Local Government Association defended the use of lobbyists saying they helped secure jobs and investment. It comes as a survey revealed 85 local and police authorities hired public affairs firms for lobbying last year. Announcing the changes, Mr Pickles said taxpayer-funded lobbying "weakened our democracy" and "tough new rules would lower the cost of politics and increase transparency". He said: "So-called town hall newspapers are already closing down scrutiny from independent local papers. Now lobbyists are being used to sidestep transparency laws and shadowy figures are peddling more regulation and special favours. "Local activism and localism don't need lobbyists. If local politicians want to change the way government operates, their council should send a letter or pick up the phone. "Councillors can campaign for change at a personal or party political level, rather than throwing away other people's council tax on the corrosive and wasteful practice of government lobbying government." The Department of Communities and Local Government (DCLG) said no criticism was being made of the public affairs firms themselves, but the public bodies who hired them were at fault. It said public sector lobbying distorted public decision making - with a statist bias for more regulation and more spending - added to the cost of politics, and meant that public money was being spent outside the local area on matters which were the remit of Parliament. If quango bosses or council chiefs wanted to put their case to ministers, they could "pick up the phone" and do it directly, a DCLG source said. But John Ransford, chief executive of the Local Government Association, said PR and lobbying firms were needed by councils to "help to navigate their way through the bureaucratic maze of Whitehall to get things done". "Local authorities only use public affairs agencies to win government support for major projects that are of vital importance to their residents. "Securing long-term investment for local manufacturing, the delivery of vital transport links and improvements to infrastructure are examples of where it is often appropriate for councils to campaign on behalf of their areas. "The delivery of these projects, and the resulting increase in jobs and investment, far outstrips the costs of employing these agencies. "Specialist companies working over a fixed-term period also often provide better value for money than employing permanent staff."